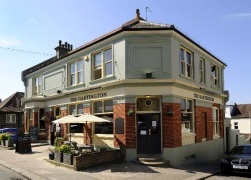 The Hartington, Brighton & Hove, BN2 3PF. The Hartington pub review, map and rating. Looking for a Hotel near The Hartington? New people have taken over this pub-a mum and 2 daughters-and a big sigh of relief because they are doing a mighty fine job of it! The decor has been titivated but it's not lost the Harty warm welcome. Doombar tasting good and the Wed quiz is a laugh. Food all day now too which suits me! Was in there last night - which was a Monday - and had a meal and a pint for £7.50. Both were good so a pretty decent offer I reckon. Rob the landlord and his friendly team ensured that I had a really great birthday party with the usual very good food, warm hospitality and patience with my demands! The kitchen was busy so the staff were attentive and gave is some complimentary nachos which was a little gesture that said a lot. I also got a slice of the best banoffee pie EVER with a candle in it that I wasn't expecting!!!! lovely. Bit of a hike up Elm Grove but worth it when you get there. Good food, large garden, nice atmosphere. Some times the local art on display inside is a bit painful on the senses.